Networking your computers and electronic devices is increasingly popular as such gadgets learn the ability to talk to each other. Many of them offer access to the Internet as well. Wireless networks are also becoming increasingly popular, for their marvelous convenience – though they have potential security issues that could cause second thoughts about going wireless. What, however, if you want to get your devices to talk and don't want to go either the wireless or the wired route, for reasons of security, convenience, interference, not knowing a convenient networking guru – or just personal choice? Why not use your building's power lines? 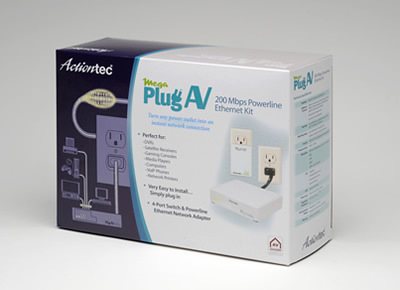 It's a concept that has been around for years, but it works quite well as evidenced by my playing with Actiontec's Mega PlugAV 200 Mbps Powerline Ethernet Kit. It's easy to use and works even better in my home than the manufacturer suggests it should. How's that for results? The Kit has four ports and not only lets you hook your computer to the Internet but it's even more ideal for connecting home theater components to cyberspace, whether they be a PVR such as a TiVO, Slingbox or satellite receiver, a gaming console like a PS3, web-enabled HDTV or a Blu-ray player on which you want to run BD live stuff. Thanks to the kit's plug-and-play demeanor, once you've set it up as outlined above it's ready to go once the adapters detect each other. A green LED lets you bask in the knowledge that you have a good connection (100 mbps or more), an orange LED indicates a connection speed between 50 and 100 mbps, while red is the kiss of death – or at least a very slow connection. You probably won't care about any of this unless you find the service really slow, and that has never happened while I've been using it. 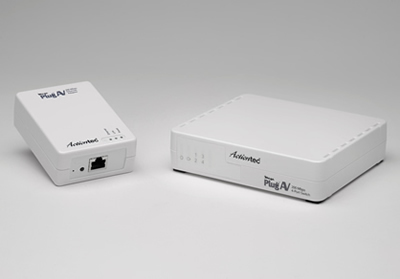 Actiontec says the Kit supports speeds up to 200 Mbps, adheres to the HomePlug AV standard, and is energy efficient, "Saving up to 60 per cent energy when placed in Energy Saving Mode." The company says it's perfect for high bandwidth applications like streaming HD video in real time and is compatible with all Routers & Gateways. One caveat they give you is that you should beware of using the system with extension cords or power bars with surge protection; in fact, the instruction pamphlet specifically warns you against doing such a thing. Well, a challenge like that couldn't do unanswered, so I immediately reconfigured the system into a "worst case scenario" test: plugging the "sending" unit into a secondary wireless router I have (which was receiving its signals from another wireless router in the basement) and using a long extension cord to get its signal to a wall socket. In my networking experience, that's a disaster waiting to happen, especially since I've experienced interference when both wireless routers were operating that caused my notebook computer to have connection conniptions. No problem with the Actiontec, though. The signals went from the second wireless router into the Actiontec, through the power lines, and out again – for example I hooked it into an Oppo Blu-ray player I was reviewing as if it were hard wired directly. The connection was made so quickly that by the time I got the Blu-ray player fired up it was already informing me of a firmware update and asking me if I wanted to download it. It works fine with BD Live features, too, for better or for worse. I haven't streamed any HD video or audio, but I have hooked a computer into the system and it works fine. I have no reason to think that streaming audio and video wouldn't work fine as well, and this is confirmed by some other reviews I've read. The system sells for $149.99. Meanwhile, the mother of computer file archiving applications is back with a new version. WinZip 14 is ready for Windows 7 and is available in Standard, Pro and Backup editions. According to Corel, who now owns Winzip, Version 14 saves time and space by making it easier to archive and extract files and transfer or store them securely. I've used several versions of the years and have noticed that, besides offering a new, "zipx" compression file format, the newer versions now give you thumbnail views of your archived files, which is a really nice touch when you're searching for specific graphics or video files whose names you may have forgotten. As far as Windows 7 is concerned, WinZip 14 takes advantages of OS enhancements that make it easier to work with documents, folders, and programs. 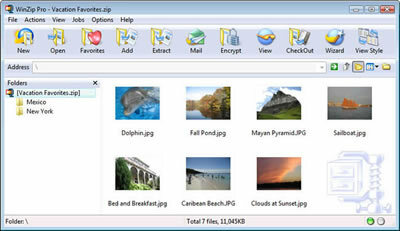 Libraries, for example, group folders together with a common theme (if you choose a Pictures library all of the folders you have that contain pictures are stored in one place, and WinZip 14 lets you merely select the Pictures library and zip all of your pictures, no matter where they are physically on the hard disk. The company also says the advanced JPEG compression the Zipx format supports means you can crunch pictures 20-25% without any loss of quality or data integrity. WinZip 14 also supports Windows 7's new Jump Lists. All you have to do is pin the WinZip icon to your taskbar for quick and easy access to frequently used zip features, as well as to recently used Zip files and WinZip jobs. I hate stuff littering my taskbar, but to each his own. WinZip 14 also includes support for finger movements on a touch screen PC, so you can scroll through the contents of your Zip files by merely using gestures (now be nice!). You can pan, zoom, and rotate your images with WinZip Pro's built-in Image Viewer, too, without touching your keyboard or mouse. The product also boasts improved security, which includes the automatic wiping of temporary copies of encrypted files after you've viewed them, apparently using the U.S. Department of Defense standard (DoD 5220.22-M). WinZip 14 also recognizes Intel-based computers with built-in AES encryption and "uses the available hardware support to make encryption operations two to three times faster." WinZip 14 Backup edition offers a Job Wizard you can use to back up important data files automatically and upload them to an off-site server using the internal FTP client. You can also burn backups to CD or DVD. WinZip 14 is available now, with pricing starting at $29.95 for the Standard edition. Add ten bucks for the Backup edition and twenty greenbacks for WinZip Pro. Existing registered users can upgrade to WinZip 14 at 50% of the new license fee.